I think I used the phrase ”grocery list” in the entry immediately below. That entry is so boring that I could not bring myself to go back through it to check. Anyway, if I did use the phrase ”grocery list,” it was not an intentional lie. It was just one of those casually misleading statements of mine. When I use the phrase “grocery list,” past experience has taught me that other people, particularly other members of my household when there were other members of my household, then tend to think that I am talking about a list written with pencil or pen on a piece of paper. I have never in my life actually made that kind of a “grocery list,” that is, one that involves paper and a writing instrument in some way. I certainly believe that written grocery lists are a good thing for everybody. They are an institution in some households, and I admire that. 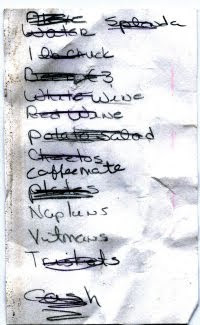 In fact, if someone else composes a written grocery list and stuffs it in my pocket on my way out the door, I will take it with me and maybe consult it at the grocery store. Such is the esteem in which I hold written grocery lists. I think so highly of them that I have thought about writing a grocery list myself hundreds of times in my life, maybe more. But when all is said and done, I always find myself at the store without one that I have written even after I thought about writing one. It is not that I cannot make myself do it. I do not know whether I can make myself do it. I have never even gotten to that stage of the endeavor. Rather and more accurately, I think about doing it and then do not even try to make myself do it. No. No. No. My “grocery list” is always in my head. A mental list, if you will. And as time passes, I find myself coming home without more and more items. A mental list is not a memory tool like a written list. A mental grocery list is actually a money saving device. My hope is that with the use of a mental grocery list when I am very old, I will be able to cut my food expense down to nearly zero. Don't worry Steve, that's how Walden gets started, too. You might not have a pond, but the location certainly is interesting, and you don't have to talk to the birds if you don't want to 'cause there are real people around. Er, I was responding to the next post and to the concept of a shopping list. Moving a bit fast on my morning surf. "I am painfully aware that so many of these blog entries are about very trivial personal triumphs that are of no general interest." I personally enjoy using an occasional grocery list. The only problem there, Bloggerboy, is that Thoreau's command of prose is a bit beyond mine. However, I was so puffy proud of the fact that I even generated a reference to Thoreau, now matter what the context. mr. anchovy, I know I would enjoy using a paper list, too. I am considering grocery list software or a grocery list template. I have added appropriate links above.